Announcement Hi and welcome to Nat B Jewelry. Thank you so much for stopping by. All of our jewelry is handcrafted and made with genuine Swarovski, gemstone and Czech crystal. Current Turnaround Time - All jewelry that is ready to ship will be sent out within 1 to 2 business days. Whenever possible, I will send out your order using the Canada Post oversized letter option. This saves you money! If any shipping overage occurs, I will refund the difference. Please note, there is no tracking or insurance with this option. If tracking is desired, please send me a message and I will update the listing for you. LOCAL PICKUP AVAILABLE: If you are located in the Toronto area, pickup can be made available. Please message me for more information. Hi and welcome to Nat B Jewelry. Thank you so much for stopping by. 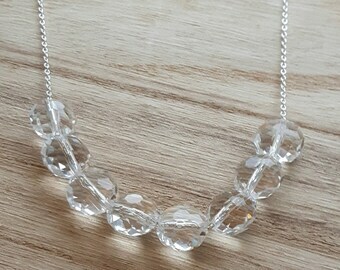 This necklace is so lovely. I'm really glad I chose the aurora borealis vs the plain crystals. It really is beautiful. 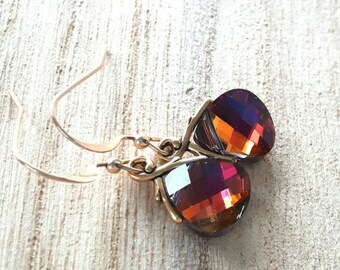 Loving these gold and Swarovski crystal earrings! I adore Swarovski crystals and especially the custom coatings. The sparkle is mesmerizing. Just a small peek into my workplace. Thank you so much for taking the time to read about my little shop. I wanted to create a line of jewelry that was not only high in quality, but also affordable. I do everything in my shop from hand picking the supplies I use, creating each piece, photographing, packing, and most of the time mailing - or I send my husband out to the post office. 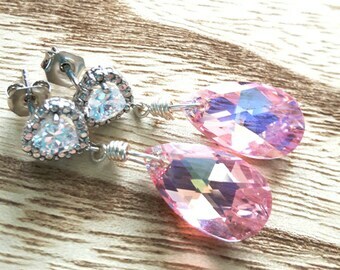 ;) I only use high quality materials and mostly work with sterling silver, gold filled, and genuine Swarovski crystals. I have a passion for creating things, and I have always been this way. I am a makeup artist by trade, a medical transcriptionist, and I make jewelry. I also have another shop on Etsy where I sell safe and modern teething jewelry and accessories for parents, and caregivers. When my son was teething I opened up Sweetpea & Sugar as I still wanted to wear pretty jewelry, but also wanted to keep it safe and soothe my little guy's gums at the same time. Thank you for supporting small businesses. When you shop with me, you are helping to create memories, and support a dream. "When you support handmade, you are not just supporting a person, small business, family, our economy; you are purchasing a small part of the artist's heart." Hi, I'm Natasha! 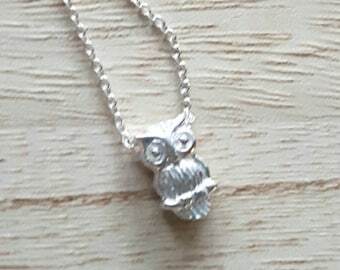 I'm a mommy and a wife, and I love exploring my creative side and creating unique jewelry. Welcome to Nat B Jewelry - Thank you for stopping by! All the pieces you see here are all handcrafted sterling silver, Swarovski and gemstone jewelry. I only use very high quality materials, and put only care and love into every piece I make. Whenever possible, I will send out your order using the Canada Post oversized letter option. This saves you money! If any shipping overage occurs, I will refund the difference. Please note, there is no tracking or insurance with this option. My main goal is for you to love my pieces as much as I love making them. If for some reason you are not happy with your purchase, please contact me ASAP to initiate a refund. All earrings are final sale due to sanitary reasons. Shipping is the buyers responsibility, and insurance is strongly recommended as I will not be responsible for items that are lost or stolen in transit. If this is the case the return will not be credited. Also, items must be returned to me in the same condition as they were sent. If a piece is broken when it arrived (that happens in mail sometimes) you may send it back to me for repair and I will ship it back to you at my expense. Pieces that are broken after they have been worn cannot be returned. Please keep in mind that my pieces are all made by hand with open link chain and jump rings. Once an item has been worn, it cannot be returned. Nat B Jewelry accepts PayPal, and major credit cards. Please make payment within 24 hours, or please send us a quick note! All purchases are packaged carefully by me, perfect for gift giving. If you are ordering a gift, please let me know and I will add in a beautifully handwritten note from you in the package and can have it sent directly to the recipient. Orders are sent out within 1-2 business days. Please note that all parcels will be shipped to the address provided through your Paypal or Etsy account. Please, please make sure that your shipping address is correct. All duty and import fees/taxes are the responsibility of the customer. CANADA SHIPPING: We ship via Canada Post oversized letter mail to keep shipping cost as low as possible, or Expedited shipping, dependent on weight of parcel. Tracking is NOT included in regular letter mail and we WILL NOT be responsible for lost packages. If you would prefer to have your parcel tracked, please contact me and I will set up this additional fee before you check out. USA SHIPPING: We ship light packet or small packet to keep shipping cost as low as possible (via Canada Post, which can take approximately 7-21 business days). TRACKING IS NOT INCLUDED. If you would prefer to have your parcel to be shipped via tracked package, please contact me and I will set up this additional fee before you check out. Canada Post tracked mail service can range from $15-$30 dependent on weight. INTERNATIONAL SHIPPING: We ship light or small packet (via Canada Post which can take approximately anywhere from 14 to 35 business days). TRACKING IS NOT INCLUDED. If you would prefer to have your parcel to be shipped via tracked package, please contact me and I will set up this additional fee before you check out. Canada Post tracked mail service can range from $15-$30 dependent on weight. I am not responsible for items lost in the mail. If you would like to purchase insurance or are in hurry to receive the item, please send me a quick message before you checkout. Insurance is recommended, that way it is trackable and you can rest assured that your package will arrive safely. Custom orders are very much welcomed and appreciated. Please feel free to message me to discuss. Bridal parties welcome. Your comments mean the world to me. If you have any problems, please contact me before you leave negative feedback. Together we can find a solution.